No, not additional posts but rather updates to the way the blog itself works. I always hated reading posts in reverse sequence so I finally found a plugin that let me change the sequence and number of posts of selected items. I have set Categories and Archives to display in chronological order so you can follow the story line without reading from bottom to top. I find it enjoyable to read through our Alaska trip and other places we have been. I have also set both options to show up to 31 posts at a time so it requires much less clicking and more scrolling. I also added a widgit that condenses the archives by year but still allows expanding to individual months. It is much better than showing all the individual months. It was getting to be a long list. Yesterday we visited the museum at the Yuma Proving Grounds. It is located on the base about three miles from us. We learned a lot about the history and current mission of YPG and both of us found it interesting. YPG began in early 1942 when George Patton was tasked with setting up a desert training center. They needed a place to train soldiers to fight in North Africa and other desert locations. There were huge chunks of desert land appropriated for the purpose, most of which was already owned by the government, and several camps were set up. The camp nearest to here was Camp Laguna which is just a couple miles from the current main base. There were lots of pictures of men during their training. It was one of the most harsh and primitive places used for training during the entire war. Some of the men who trained here have donated photos and letters they wrote while here. Most do not have pleasant memories of the place. Even during the war the area started being used for testing military equipment. Strangely, one of the many things developed and tested here during the war was river fording equipment. We saw pictures of the temporary bridges built on rubber rafts that were used to cross rivers in Europe during the war. The ability to control the amount of water in the river by using Imperial Dam gave them a tool to test different flow rates and develop a system that worked. During the testing several tanks were dropped to the bottom of the Colorado. Starting after the war in 1950 the current Yuma Proving Grounds developed. They have tested every piece of equipment used by the US Army here and in the other two test areas that are managed from here. This is the desert test facility but they also manage the polar test facility located in Alaska, and the tropical test centers located in Panama, Honduras and other locations. They told us that there are currently about 1,000 different items being tested, including devices used in Iraq. They actually constructed an Iraqi city to look like Bagdad where they could find ways to locate and destroy IED’s. That program is still under way and even included testing to see if bees could be used to find the devices since they are drawn to some of the chemicals found in explosives. When driving by or visiting the housing section of the base where we were, the impression you have is that not much is going on here. In fact there are about 3,000 employees working here every day, of which only about 100 are military. The rest are civilian contractors. It is a very busy place. One additional thing we learned is that this is the training facility for HALO (High Altitude Low Opening) teams. About 1,000 paratroopers go through the school here every year. They learn to parachute from very high altitudes and free fall to an area that may be miles from where they jump before they open their parachutes at low altitude. It it a technique used mostly by special forces. The Golden Knights, the Army parachute demonstration team, also trains here from the middle of January to the middle of March each year. We have seen them at air shows several times. A few years ago I remember hearing about George Bush senior sky diving on his 72nd birthday. The first time he had parachuted was bailing out of his airplane when he was shot down during WW II. That birthday parachute jump was done here at YPG, the only time a president or past president has ever visited the facility. By the way, he has since made additional jumps, the most recent was just last year at the age of 83. He parachuted in to the reopening of his presidential library in College Station, Texas. Earlier in the week I toured an outdoor exhibit where some of the vehicles tested here were displayed. 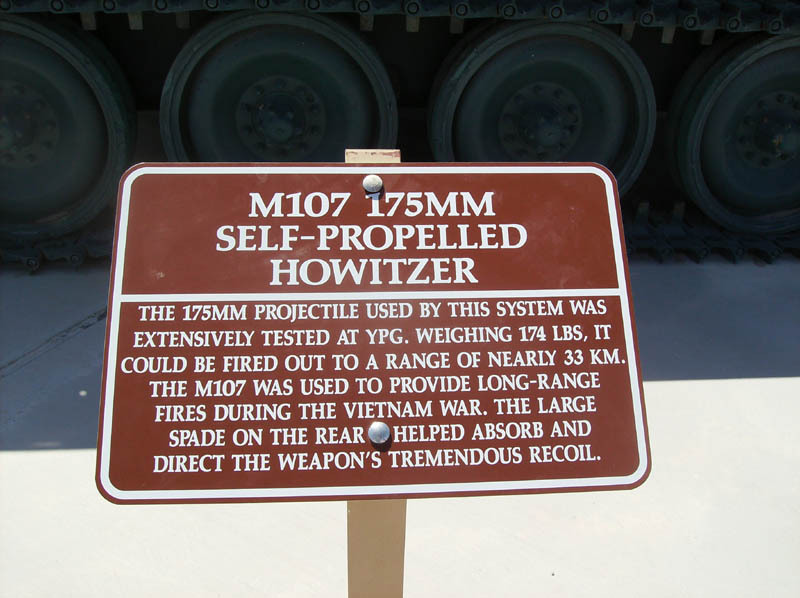 One was the 175 MM Self Propelled Gun I worked on in VietNam. In fact, I fired one once while at Fire Base Bastogne into the Ah Shaw Valley where some serious fighting was going on near Hamburger Hill. We will only be here a few more days and then we are off to San Onofre. We moved from Quartzsite to Imperial Dam today. We are about 20 miles north of Yuma along the Colorado River. There is another Long Term Visitor Area here where we have all the same services we had in Quartzsite, and our pass from there is good here also. I remember when Mom and Dad spent some time here. We visited them where they were parked along the river. That is no longer possible unless you want to pay $15 per day. The area we can stay in is located up on a mesa on the California side of the river. It is very different from Quartzsite which is level ground with a few dry creek beds running through the desert. Here the land is mostly hilly since the river has cut down through here sometime in the distant past. It is also 3 to 5 degrees hotter here than in Quartzsite because it is lower in elevation. It got up to 89 today, which is hotter than we enjoy. After arriving this afternoon we rode into Yuma to do some shopping. The road runs along the river for a few miles and then through fields of produce. It is actually quite pretty and the green fields are much cooler. When we returned home I set up the satellite and TV dishes while cooking a turkey breast on the grill. It came out very good. While in Quartzsite we didn’t do a whole lot. We rode down to Yuma once and to Blythe once for shopping. 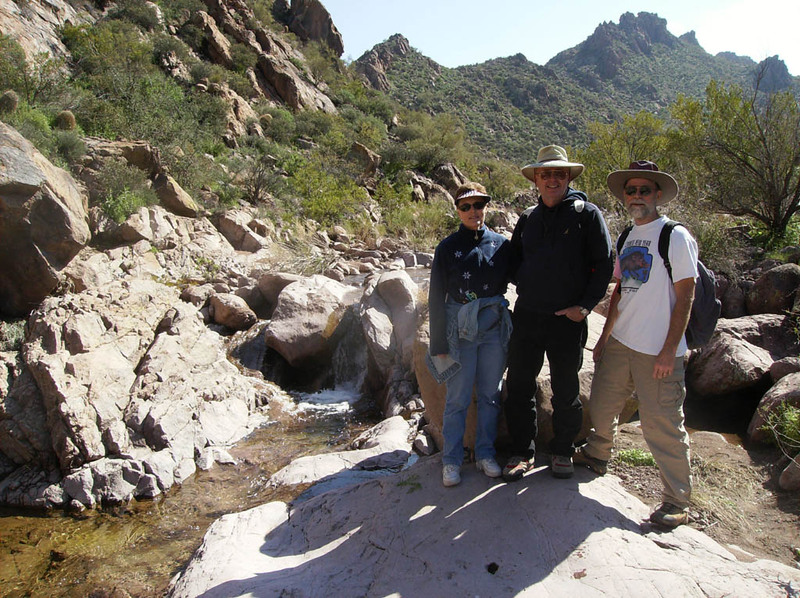 We also took a trip south of Quartzsite to Palm Canyon on the KOFA National Wildlife Refuge. The only palm trees native to Arizona live there in a very narrow canyon. Other than that we just did the normal stuff; hauling water once or twice a week, grocery runs to town and taking walks in the evening. We plan to be here until we move to San Onofre where we will spend the summer. That move should happen on April 1. Until then we are just going to try to keep as cool as possible. We are sure about that because we saw it today. 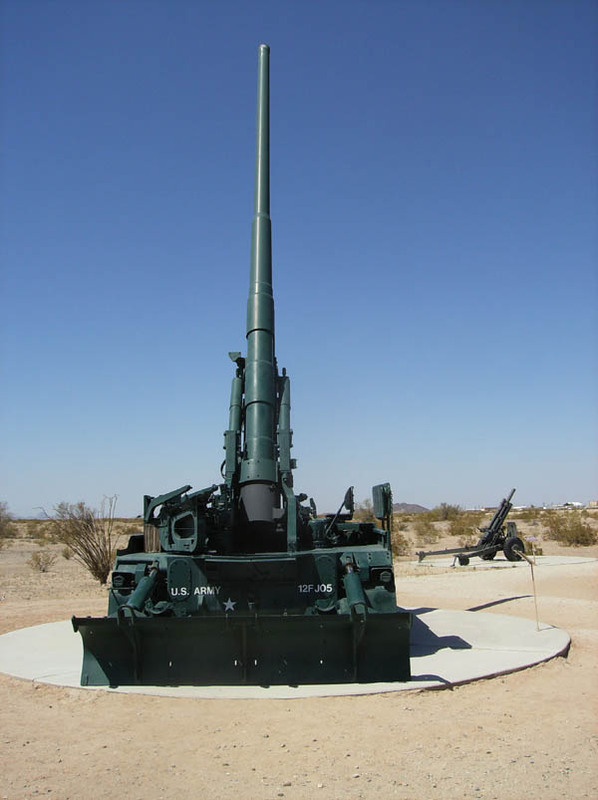 Well, maybe it was taken down, moved, and reassembled, but it is still doing its job in the Arizona desert. Most people are aware of the fact that the bridge was moved from London to Lake Havasu almost 40 years ago. We first visited the area sometime in the mid to late 1970′s. 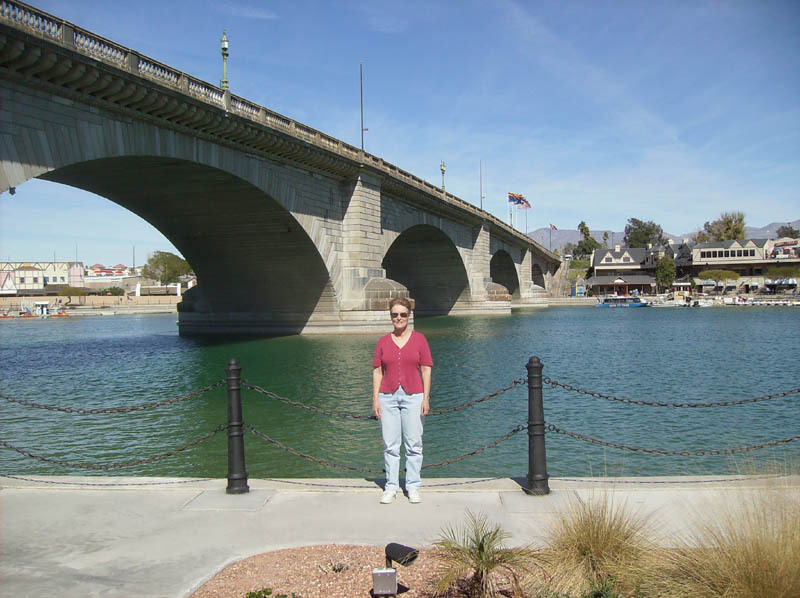 At the time the McCullough Company was promoting a land development on the eastern shore of Lake Havasu and thought the bridge would draw people to the area. It did, and now the city of Lake Havasu is a city. I am guessing it is the largest city on the Colorado River except for Yuma. The weather was forecast to be really nice today so we planned a scooter trip. We left about 11 AM and stopped first in Parker, AZ, about 35 miles from Quartzsite, for a short break. Then on to Lake Havasu City, about another 40 miles north along the river and lake. Lake Havasu is formed by Parker Dam which is located about 18 miles north of the city of Parker. Our first stop was at a Red Robin for lunch, and then we wandered around the shops at the foot of the bridge. We both remember it being new and interesting when we were last here about 25 years ago, but things have fallen into a state of decline. Many of the shops are closed and they are apparently planning some redevelopment of the whole area. It needs it. Interestingly, there is a candle shop there where we bought a Christmas candle about 30 years ago. The candle shop is still there and the same people own it. It is probably the biggest and most successful shop in the area. Here is a picture of Dianna standing below the bridge. We then rode around the island where the bridge goes. It is a large island and has many RV campgrounds, golf courses, marinas and condos, with more being built all the time. We then made a stop at the local WalMart before heading south again. We turned off at the spur road to Parker Dam and crossed over to the California side for the 19 mile ride down to Parker again. The road is much older and follows the river so it is a much more enjoyable ride on the scooter. Crossing the dam is only permitted for passenger cars an motorcycles. It is obvious 9/11 has had a huge impact. There are big barriers you have to weave through before arriving at the bridge itself, and there are guards standing around. They don’t even allow people to walk across it anymore, even though there are sidewalks. In Parker we stopped at McDonalds for hot fudge sundaes and then we rode home, arriving back at our trailer about 5:30. The total trip was about 160 miles and both of us are a little saddle sore, but it was a fun ride. The temperature was about 80 degrees this afternoon and there was no wind to speak of. Great scooter riding weather. We have been in Quartzsite for about a week now. It is a pretty boring, yet somehow satisfying place to spend some time. It is boring because there is not a lot to do, especially this time of year. Most of the shows and booths are held in January. By the middle of February many of the people are gone and it is just the hardy, long term people who are still here. Many of them stay the whole season, starting in October and staying until the middle of April. It is somehow satisfying because we use only electricity from the sun, yet have all the power we need to be on the internet all day long and to run both TV’s from about noon till 11:30 PM. The only time we have run the generator is when we do laundry. The water source and the dump station are only 1/4 mile from us so we make that run every three days or so. We did move the trailer a bit today. When I parked it originally I thought I was pointing east, but soon realized that I was looking at the wrong mountain pass and we were pointing about 30 degrees south of east. That kept the sun from hitting the solar panels, which are tilted up toward the south, until about 9:30 AM. That meant we did not get any solar charging until then so it has sometimes been the middle of the afternoon before we could start watching TV. It was not a real problem, but I hate to waste two hours of sunshine each morning. Yesterday I did finish one project for which I had purchased the parts in December. Our water heater is the instant on type, which means there is no tank and water is heated only as it is required. Although it provides a never ending supply of hot water, it takes a few seconds initially for water to get hot. The bathroom sink is also quite a distance from the water heater, and with the few seconds required to heat the water initially, it takes more than a gallon before the very hot water arrives at the sink. I hate to waste that much water, especially when I have to haul it all in and out. So, I installed a bypass valve on the side of the bathroom vanity and added tees and tubing to allow the water from just below the faucet to circulate back to the water tank when the valve is opened. That allows the lines to fill with hot water without any water going down the drain. Now we just open the valve for 15 seconds or so before we are ready to wash, and then we have hot water almost instantly. Now we can wash our hands in hot water without wasting a drop. Some homes have recirculating systems that accomplish much the same thing but they would not work with the instant on water heater and would use a lot of power to run the pump all the time. This works quite well for us. Other than taking some walks, we have made a few trips into town on the scooter for groceries and to look around. Not much has changed since last year. We will probably stay here for a little longer and then, when the mood strikes, move down to the Yuma area. We have been in Mesa for about two weeks now, and plan to leave tomorrow for Quartzsite. We have been staying at a recreation area named Phon D Sutton which is located along the Salt River about 6 miles north of the developed part of Mesa. During the summer it is a parking lot for day use visitors, most of whom are riding the Salt River on inner tubes. During the winter season dry camping is permitted in the parking lots. We are using our solar capability to good advantage, and have found a service station in Mesa where we can dump our holding tanks and get fresh water. With our satellite set up we are very comfortable, although cell phone service is touch and go. We have visited Mom a couple times, had dinner with Mom, Daryl and Donna; hiked the nature trails here along the river and gone to Gardunos Mexican Restaurant to celebrate my birthday and Valentines Day. Today we went for a hike with Daryl and his botanist friend Les. We drove a short distance up the Apache Trail and hiked into the Superstition Mountains a ways. We started out on a very busy trail, but soon left the trail and followed a mountain stream up hill for about half a mile. It was rough going in spots, and the water was really flowing since we have had a lot of rain in the past couple days. Tomorrow we plan to continue our journey west. This has been a good place to spend a couple weeks. Maybe in future years we may spend more time here.